Here at deBebians, we get a lot of calls about designing custom jewelry. Recently, I got a call from a great client of mine wanting a very unique colored gemstone and diamond halo ring. I always have so much fun sourcing colored gemstones. To me, there is so much to look for as shape, faceting, color, tone and saturation can all vary so much. It also reminds me of my days studying at GIA (The Gemological Institute of America) in Carlsbad where we had to identify colored stones to complete the Graduate Gemologist program. If you’ve gone through those classes at GIA, you know what I’m talking about–20-stone exam, anyone? My client wanted a bluish/greenish colored stone that reminded her of the color turquoise. I made some calls and found this indicolite tourmaline (above). This particular tourmaline is 7.50 carats and has a very long and unique length to width ratio. The faceting on the gem is gorgeous and the color is amazing, too. What do you think about this tourmaline? 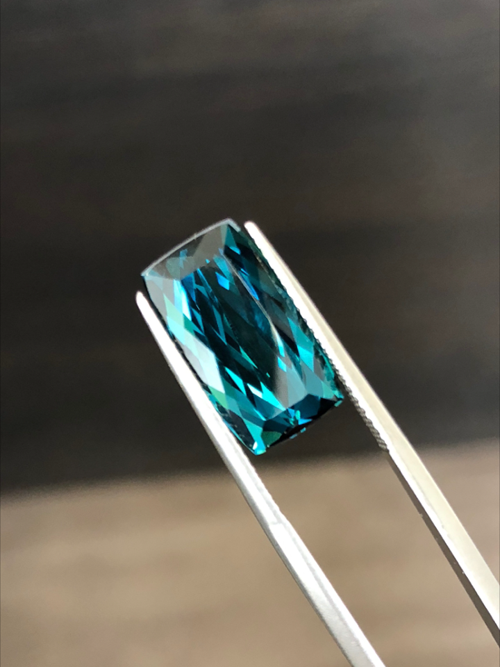 Knowing my client was seeking a more traditional cushion shaped gem, I sourced this 8.77ct cushion cut indicolite tourmaline (above). Having a more classic rectangular shape, this cushion cut gem is a beauty! Can you imagine this stone set with a halo of colorless white diamonds around it? If you are looking to source a colored gemstone, make sure to contact us! We have sourced stunning sapphires, tanzanites and tourmalines including both indicolite and paraiba, to name just a few. We are here to help with your custom gemstone creation. Visit our site to learn more about the custom design process. Happy shopping!